According to many seasoned boat owners, the two happiest days in their boating lives are when they buy their boat and when they sell their boat. The best way to sell your boat is through a broker – they can qualify the buyer, do all the running around for you, ie: place the ads, qualify the buyer, show your boat, etc. A broker truly earns their commission. 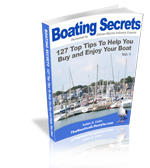 If you decide to sell your boat privately, you’ll have to scour magazines looking for names and contact information to place ads then contact magazines and possibly run around putting up signs. A broker has access to other brokers and better websites to place ads. A clean boat sells. Stay interested in your boat as well. Once you start losing interest in your boat because you’re selling it, the buyer picks up on this. It starts to show because things start going on the boat and nobody fixes them. Don’t expect buyers to fix things either. If something breaks or looks ratty, you need to repair or replace it. This shows the potential buyer your boat is loved and cared for. That energy rubs off onto the new buyer. Your engine room must be clean – no oil, grease or paint chipped parts. This is the biggest killer in any deal to sell your boat. It’s like walking into a new home and someone left a messy, moldy, grungy mess in the bathroom. Same idea. It’s disgusting. Also, clean the bilge, hatch and rain catch as well as clear outboard drains. A broker has access to various sites, books such as ABUS, BOK, and Powerboat Guides, Search the internet for similar boats with similar features. Find the same model year as your boat and add 10% difference in price. The biggest depreciation in a boat is the first three years. Exterior photos should be of the port, transom, starboard, stern and bow. Interior photos should be of the electronics, forward cabin, engine rooms, heads, galley, living room, etc. If the boat is out of the water, take photos of the propellers. You’ll also need photos of the helm, flybridge, companion and mate helm seats. Put yourself in the buyer’s seat and don’t take photos of anything that does not go with the sale. Also, don’t take “crime scene” photos (close-ups), take overall photos (wide-angle). A full description of the boat, # hours on engine and generator, and major rebuilds. Reveal weaknesses, fresh water or raw cool, why you’re selling and how long you’ve owned the boat. Don’t mention anything you’re not willing to sell or include in the purchase. March through September with a lull in August and September. April through June, people are looking, especially for the 4th of July. November is quiet again. If at all possible, have the boat in it’s natural environment (the water) for the best show. Don’t use your boat once you’ve signed a P&S and/or have a deposit. Make sure you maintain insurance till you close the deal. Again, get rid of all the crud around the portholes, batteries are acide free, no mold or mildew showing anywhere. Then, take off the plastic while demonstrating your boat. Let the new potential owners feel the wind in their face. Don’t forget to empty the holding tank! Also if the water has been siting in the hot water heater a while, drain and flush with fresh water. Make sure the fuel is fresh and the oil is recent. While this may be a regional variation, here in Southern California you want to put your vessel on the market in January for the spring & summer. Have all maintenance records, receipts and a copy of the last survey.